This clever toy that lets outdoor artists stand up and draw on any surface with ease. From neighborhood treasure hunts and epic hopscotch tournaments to impressive wall murals, kids can chalk it up to having the right tools. 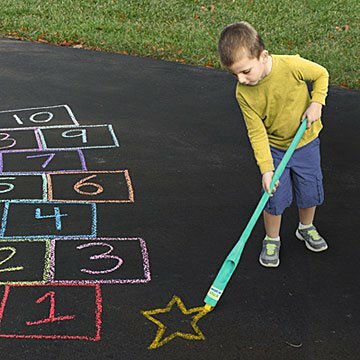 Looking for an easier way to draw roads around their driveway for their children, Shauna Damman grabbed a broken rake handle, zip-tied a piece of chalk to it, and, with that, a brilliant idea was born. Say farewell to scuffed knees and dirty hands with this clever toy that lets outdoor artists stand up and draw on any surface with ease. Just pop any stick of sidewalk chalk into the tube and take your creative vision to the streets. Ages 3+. Designed by Matt and Shauna Damman. Made in China. “We initially invented it for us, the adults—shhhh, don’t tell the kids!,” jokes Matt Damman who, along with his wife, Shauna, created Walkie Chalk™. Looking for an easier way to draw roads around their driveway for their children, he grabbed a broken rake handle, zip-tied a piece of chalk to it, and, with that, a brilliant idea was born. Drawing from his background in manufacturing and marketing, his clever tool went from DIY prototype to finished product in just seven months. Walkie Chalk is designed to be “simple, durable, and universal,” and while it was initially designed for kids, Matt says it’s also been used to spread political messages and has been a valuable tool for physical therapists who help clients of all ages build fine and gross motor skills. This was a gift to reward extra special good behavior while traveling. I recommend this toy for 4-7 yr old children. Kids love sidewalk chalk and the Walkie Chalk allows them to be creative while also saving on their knees. Perfect gift for our 3 children all under 12 years old - keeps them busy, they can draw big creative things - well made product! My grandchildren LOVE their Walkier Chalk! My grandsons immediately loved this gift and have been playing with it daily! My 5 year-old granddaughter thoroughly enjoys playing with this toy! She loves drawing with chalk on the sidewalk and really likes the different perspective of drawing from a distance. The "stick" comes in sections and can be used as one unit or in different lengths. She does, however, need help inserting the chalk. Once that's done, she's good to go! This item is good for any age aspiring sidewalk chalk artist.